Getting mail out the door is a quick and painless process with these white address labels. 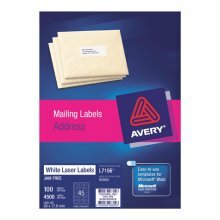 Create custom labels for all your mailing needs. Combine names, addresses, logos and barcodes into one of a kind label designs. Then print professional looking Jam Free labels from your laser printer. With mailing this convenient, all you'll feel is satisfaction.